My daughter, who has been in a wheel chair for almost two years has told me her own horror stories about navigating the Tel Aviv streets and sidewalks. These--streets and sidewalks--were not built in the early years for accessibility. No one had any idea what that was. The disabled were in essence shunted aside, and were effectively excluded from typical activities which we consider to be 'normal' and which are totally accessible in the United States, such as traveling by bus to a restaurant, being able to enter the restaurant and sitting at a table, going shopping at the shuk (outdoor market), going to a movie--just to name a few. There is very little in this young country which is accessible to people in wheelchairs. Israel is somewhat like the United States was before the enactment of the Americans with Disabilities Act,which was enacted in 1990 and amended in 2009. The activities which I mentioned above being inaccessible are bad enough, but how about something we do not even think about here in the United States: getting into an accessible bomb shelter when the warning sirens go off, 15 to 20 seconds before the rockets hit? Unfathomable! a wheelchair-bound person would be totally vulnerable in a rocket attack: unable to enter the bomb shelter not only because of a locked gate, but very often (most often) the actual sidewalk is not level and is broken or cracked and thus uneven, creating dangerous navigating for someone who is unable to stand, let alone walk--like my daughter. ...Moravia can’t run. She can’t even get up on the sidewalk. Pushing a lever on her wheelchair, she rolls down the street looking for a ramp or a dip in the curb that she can ascend without tipping backward. If she can manage to reach a shelter in time, she often won’t fit inside, stymied by tight corners impossible to negotiate in a wheelchair. Of five shelters in Sderot’s central district that Moravia tried to enter recently, only one was accessible. This so reminds me of what my daughter is doing, advocating for change in Israel-including with her volunteering at the Center for Independent Living's Tel Aviv branch--awareness-by the government as well as the general public. Awareness leads to understanding the needs of those not as fortunate, those who need physical assistance of some kind. And it leads to accessibility: renovating existing entrances, repairing and accessorizing sidewalks to be usable by the wheelchair-bound, and legislating for new construction to be accessible to all. 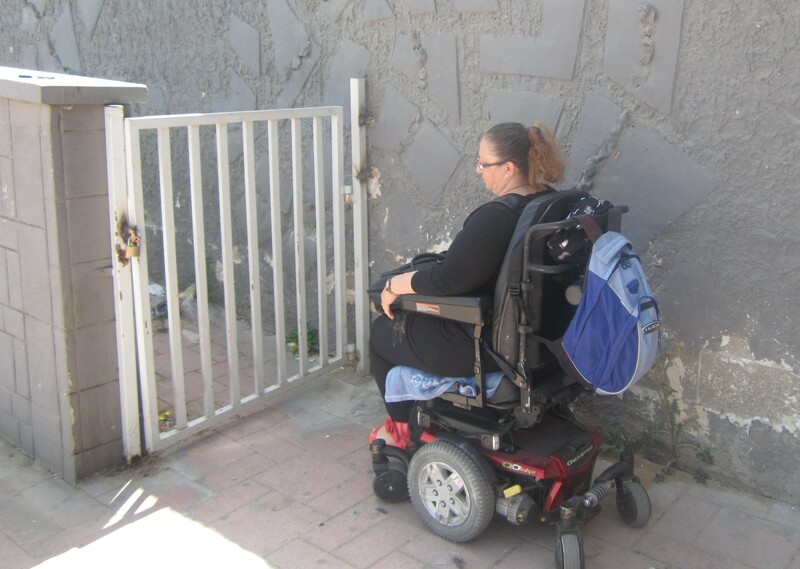 Meanwhile, the accessibility situation is grim for Israel's disabled. What "horror story" (see the very first sentence in this post) happened to my daughter? Some time ago, in the course of navigating her wheelchair over bumpy and cracked sidewalks, she actually encountered a "ramp" for the disabled. Unfortunately, it was built badly, uneven and incorrectly banked. The result was she fell over in her wheelchair on her back and into the street, right in front of traffic. She told me that several drivers driving on that street saw her fall, screeched to a stop, and got out to help her right herself. She was scared and dazed--and VERY angry at the system. She travels everywhere in her neighborhood by herself, wheeling herself to the store--supermarkets, the pet supply store, Ace Hardware, HomeCenter--and even though she takes a cab to the Azrielli shopping center, she sometimes wheels herself back, and that is a distance of 2.2 kilometers (1.37 miles, and across the Ayalon highway), with nothing more than her upper-body strength. She has to traverse inaccessible areas, and I worry myself sick over this. But she wants to be independent. I understand, and I'm proud of her for it. I know we're far from perfect, but there have been improvements here in Israel. In our neighborhood shul, literally in our backyard, the recent renovations added ramps to 2 sections and there's a downstairs Ezrat Nashim, too. A few minor corrections: firstly, I've been in a wheelchair for nearly two and a half years. Also, Israel is no where near where America was in the late 1980s--it's more like how America was in the 1970s--well over 30 years behind the United States with regard to accessibility. Israel is considered 70% inaccessible both physically and socially, according to recent polls taken in 2012. And lastly, what you wrote is only the tip of the iceberg with regard to bomb shelters: in addition to locks and narrow corners, many bomb shelters (in particular in areas like Tel Aviv and Jerusalem, and other areas that haven't needed their bomb shelters for a few decades until very recently)also have long and dark stairwells leading into them. This means that a large majority of the one million people with disabilities living in Israel don't have adequate access to the shelters in an emergency. In my case, I would just run to my bathroom-it's no bomb shelter, but it's the only room in my home that does not have windows and that is surrounded by more of the building on all sides. I was on crutches in Israel for the summer of 1996, and I remember how difficult it was to get around Jerusalem, with uneven sidewalks, cars blocking the sidewalk, etc, etc, etc. I can only imagine how much worse it is for a wheelchair bound person. What experienced was just a hint. Is there an organization I can donate to that is fighting this fight? The JTA article mentions Struggle for the Disabled, but I didn't see a link. My husband is mostly wc dependent for out of doors, he has limited mobility. He is for the most part "housebound" b/c of all the difficulties involved in traversing Jerusalem and elsewhere. He cannot use an intercity bus as the steps are too high to climb and there is no w/c accessable lift on those busses. We don,t drive anymore so that means an expensive taxi or hoping a friend can help out when he needs to get to the doctors or for tests. Even our rented home is difficult due to the the many steps involved. 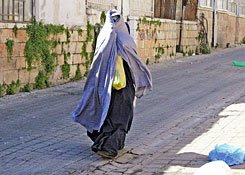 There are many issues in addition to uneven pavements and bomb shelters. Everyday activities are sharply curtailed. We can't even go out on a "date". BUT... we chose to live here, we love Israel and rather than complain, we want to help in a constructive way so that the future will be better for those that follow. Thank you for writing this post and bringing the issues to the forefront!